There comes a time (or a bunch of times) in a Marist student’s life when they need to get off campus and out of Po-town for the day. The obvious solution would be to hop on a train and head down to New York City, but there is only so much fun to be had in the Big Apple before it loses its charm. There are a plethora of fun activities and day trips that Marist students can take, all within a few hours of campus. From fresh air and nature to cool shops and fun foods, there is no end to the possibilities. Here we handpicked several of our favorites for your fall entertainment; so bundle up, pack up your friends and make some memories. 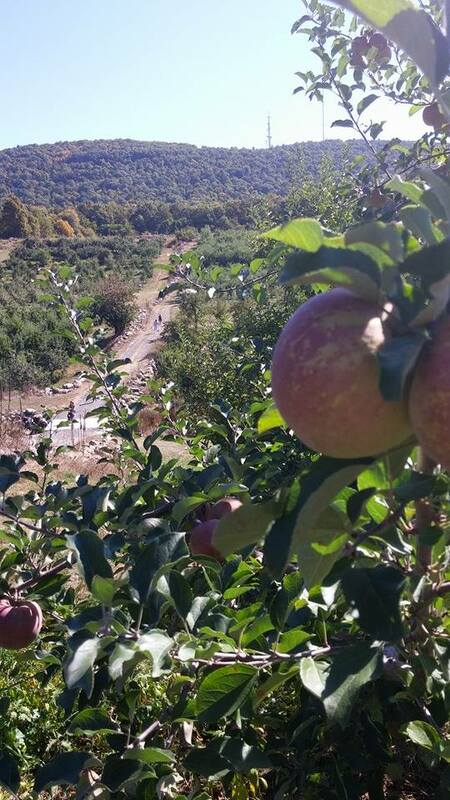 With New York’s reputation for apples and the Hudson Valley’s abundance of orchards, this day trip is a no brainer. If climbing trees and eating fresh picked apples are not enough of a draw, many orchards offer pumpkins- great for carving jack-o-lanterns for outside of your door- hay rides, corn mazes, and other fun activities. Wilklow Farm, in Highland, is a mere 15 minute drive across the Mid-Hudson Bridge. They have a huge orchard perched on the side of a picturesque mountain, along with delicious cider donuts and a market where you can buy all kinds of goods- from apple pies to cider to homemade popcorn. Their prices are not too shabby either- $22 dollars for a bushel bag which will hold more apples than you will ever be able to eat. They will also transport your bag of apples back to the farm via tractor if you drop it off at one of the designated pick-up stands throughout the orchard. If you go with an end use in mind for the apples, remember that certain apples are in season during certain times of the year, so check what kinds of apples you need before you go. Do not be afraid to ask the orchard’s workers for help with this conundrum, they have probably answered this question fifteen times before you today. For more apple orchards in the Po-town area check out this website set up specifically to help people like you find the right orchard for them. A short half hour ride away is another little college town called New Paltz. What Poughkeepsie lacks in the traditional college town charm, New Paltz brings in its small shops and delicious food places. Start your day at the quirky Main Street Bistro which offers up a $2 brunch (add a dollar and you can have bacon or sausage too) along with a great selection of other breakfast and lunch foods named after musicians and local landmarks. Try to get there early though and wait for a seat at the counter to open up to cut down on your wait time since this place fills up quickly. If you’re in the mood for a quick snack, check out the Huguenot Creamery, a little homemade ice cream shop offering up all sorts of flavors. Try one of the floats- you can combine any flavor soda and ice cream. 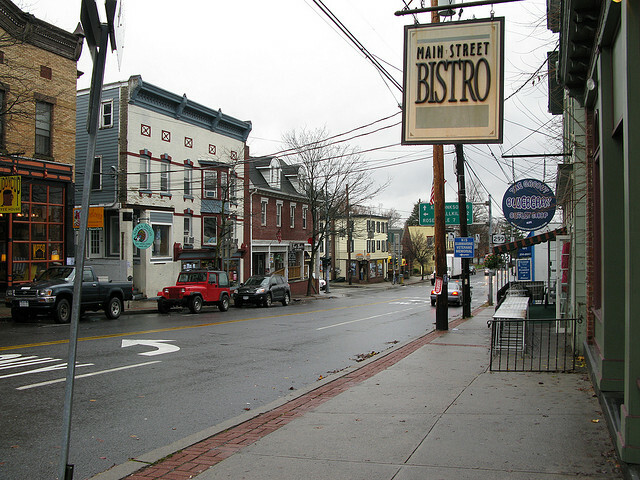 On Main Street you’ll find a variety of small stores and boutiques to check out. One boutique, the Groovy Blueberry, is one of several shops offering up all things tie-dyed and Woodstock—y and nestled below one of several bookstores is Rhino Entertainment, a record store hailing back to days before iPods were the norm. Be sure to visit Huguenot Street while in New Paltz. This street is the oldest inhabited street in the town, hailing all the way back to the 17th century when the Huguenots settled in the area. Wander through the streets yourself and look at the well preserved buildings, or take a walking tour with historically dressed tour guides to get a real feeling for the era. New Paltz boasts a large amount of dining options for a night out. Try the Golden Otter Brewery, which offers lunch and dinner along with a huge selection of beers and wines, including their own house-brewed lagers. For a lighter, low-key affair try Mexicali Blue, featuring Southwestern and California cuisine and great reviews. If you are looking for a place with a nightlife, check out P&G. This restaurant prides itself on being a “cornerstone of New Paltz” and is well known among locals and outsiders alike. At night, P&G becomes a night club popular with students from all the nearby colleges. 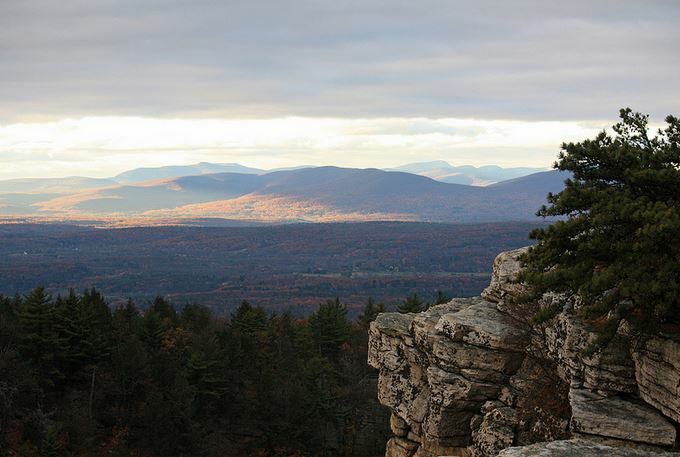 While you are in New Paltz, head over to the Mohonk Preserve in the nearby town of Gardiner. The Mohonk Preserve is an 8,000 acre nature preserve boasting an array of trails suited for running, hiking, biking and climbing as well as educational programs throughout the year. The preserve encompasses a large part of the Shawangunk Ridge whose characteristic white cliffs and outcroppings can be seen throughout the preserve. There are over 70 miles of carriage roads and 40 miles of trails for visitors to explore. The trails lead through forests past cliffs, fields, ponds and streams, letting you get lost in nature (just try to avoid actually getting lost). There are several hikes, ranging from the easiest at a quarter of a mile, to a strenuous 7 and a half mile round-trip hike by High Peters Kill. One of the more popular trails among hikers and Marist students alike, is the Bonticou Crag hike. This trail takes hikers on a moderate 3 mile round trip through open fields and woods to the top of a bleached white crag overlooking the valley below. To get to an even better view, hikers can climb the rock scramble up, although the scramble is noted as being challenging. Rock climbers can ascend over 1,000 trails up the stark white faces of the Shawangunk Ridge. Referred to as the Gunks by climbers, these crags and cliffs offer some of the best climbs in the country. Sharp angles, deep fissure and boulders create an ever changing landscape for climbers to explore. The preserve also had one of the best vertical rescue teams in the northeastern United States, according to its website. There is a $12 day fee for hiking, and a $17 day fee for biking, climbing or horseback riding on the preserve. The Mohonk Preserve is open from dawn to one hour after dusk every day. Polepell Island is home to what was once Bannerman Castle, a defunct military surplus storage space and residence for a Gilded Age businessman. Now only ruins of parapets show in the water, and only two sides of the crumbling castle stand, with the words “Bannerman’s Island Arsenal” emblazoned across a decayed wall, visible from the river’s edge. Frances Bannerman was a Brooklyn based businessman who dealt in military surplus, among other things. After the Spanish-American War in the late 19th century, government officials in New York City pressured Bannerman to move his munitions out of the city to a safer location. Bannerman purchased Pollepel Island in 1901 and began to build on it a simulated Scottish castle and small residence. He stored his ammunition surpluses here and used the island as a summer home. Pollepel Island was believed by Native Americans, and settlers thereafter, to be a haunted island. Looking at the island now, with its castle in ruins and nature overtaking the once manicured island, its not hard to believe the place to be haunted. In fact, some people attribute this haunting to the fire and partial collapse of the main building that have destroyed what was once a great arsenal. If haunted islands and crumbling castles are enough to lure you in, tours of the island run from May through October. A passenger boat departing from docks in either Newburgh or Beacon take you to the island for a walking tour of the grounds. Reservations are required and departure times do vary depending on the tides. 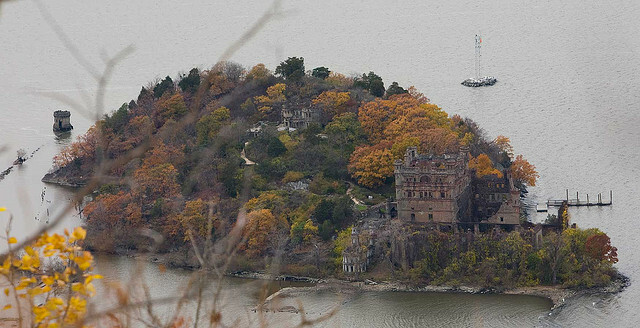 The tour of Bannerman Island will not last all day so plan in a few more activities to get the most out of your trip. While in the area, walk through the quaint town of Beacon, which boasts an artsy crowd and many small boutiques and eateries. Or hop in the car and take a fifteen minute drive to Cold Spring to the Chuang Yen Monastery. This monastery holds the largest statue of Buddha outside of Asia, beautiful gardens, and a population of practicing monks. Last, but not least, an option for our more adventurous Red Foxes; Adirondack Extreme Adventure Course is a tree-top obstacle course set in the beautiful Adirondack Mountains. Located about two and a half hours from Poughkeepsie in Ballston Spa, this is our farthest pick for a day trip, but also one of the most physically active and fun. The Adventure Course is a series of courses for all ages and skill levels. There are six levels of adult courses, each getting higher in elevation and difficulty. Each course has a series of wobbly elements strung up in the trees, ranging from swinging bridges, to suspended pillars, to rope swings and zip lines. Each tour is self-guided, meaning you can move along at your own pace. If you cannot complete a course, you can be “rescued” by one of the many guides stationed throughout the courses. During the entire course, visitors are attached to a safety line by a harness and cord. Not to worry though, the heights will still be enough to send your heartbeat soaring and get adrenaline racing through your veins. The course is nestled in the Adirondack Park, the largest state park in the country. The course runs through the ancient forests and across streams, which, during this time of year, are set ablaze with color from the changing leaves. Reservations are recommended at this time of the year and the park closes for the winter in November. The price for this adventure is a little steep, but to get so far off campus for a few head-rushing hours can be worth it. While in the area, be sure to stop by Lake George Village to catch a glimpse of the miles long lake by the same name and enjoy some of the attractions it has to offer, including steamboat rides, a French and Indian War era fort, historical buildings from the time period and your usual tourist trap fare. The area is also abundant in hiking trails, lakes and small towns snuggled in the surrounding mountains. This entry was posted in Lifestyle and tagged #Marist, adirondack extreme adventure course, adirondacks, apple picking, bannerman castle, day trips, Hudson Valley, mohonk, new paltz, pollepel island. Bookmark the permalink.